For our first stop, Bree & Jake let me take them to one of my absolute favorite places to photograph, the Nelson-Atkins Museum. I’ve said it before and I’ll say it again: This place has it all! You want lush greenery and great open spaces? It’s got it. You want a handsome classic architectural vibe? It’s got that too. Maybe you want to throw some modern vibes in, just for good measure? Oh, the Nelson has that too! Our second stop was the National WWI Museum & Memorial. I love photographing here, and I especially love finding new ways to use this beautiful Kansas City landmark. Bree & Jake were absolute troopers - even in the heat - and agreed to walk all the way down (and therefore back up!) the hill to the fountain in front of Union Station. Along the way, we got some amazing shots on the Memorial’s north lawn, a spot rarely used for photos. Now Bree & Jake have some truly unique photos to enjoy from their engagement session that I couldn’t be more proud to have photographed! 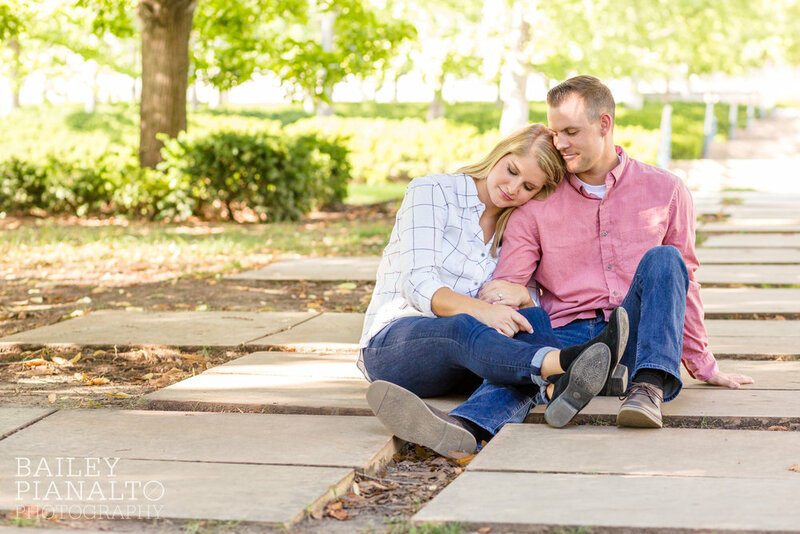 Below are just a handful of my favorite laughs, smiles, and shared moments from Bree & Jake’s engagement session. Tell me your favorites in the comments! Congratulations to Bree & Jake! I am so grateful to be a part of this wonderful time in your lives. Your May wedding is just around the corner and I simply cannot wait!